Over a hundred poems, attributed to 44 women: the poets are organized based on their status in their society—Women of the Court, Women of the Household, Courtesans and Entertainers, and Women of Religion. Thumbnail biographies of each poet and notes regarding individual poems complete the collection. 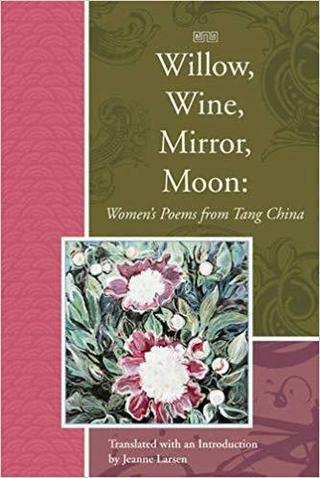 "By far the best book of Chinese poetry in translation of the new century.... Jeanne Larsen is the first 'Western' scholar / translator to honor the work of her Chinese predecessors, to leave the collection un-colonialized, and her decision to do so yields her audience a book full of truly interesting, and sometimes deeply moving, insights into the life of women in China more than a thousand years ago...I don't think there is a mediocre, much less a bad line in the book,...making every single line a completely new experience of excellent, no, make that exciting, new poetry." "Larsen, a noted poet in her own right, captures in her translations these medieval voices in all their vitality and freshness." Buy HERE from BOA, or on Amazon, or through your local indie bookstore. Bookstores: BOA distributes through Consortium. "Silenced people can find ways to reach into the world around them. They can defy a social rule or make clever use of one. They can object obliquely to how things are. Their voices do sometimes enter history's register....Reading poems created despite restrictions on education and self-expression can open one more door to the enlargements of mind and spirit that aesthetic practice offers artist and audience alike."